A SAFETY WARNING TO OUR COMMUNITY. We’ve all heard the phrase; “If it’s too good to be true, then it probably is” but the fraudsters are getting even more advanced about how they can convince you otherwise. 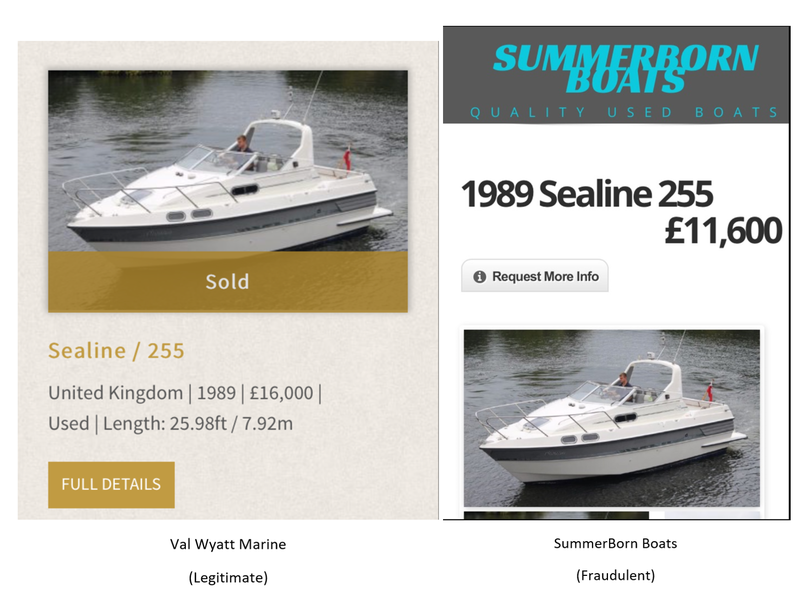 One of the most recent examples has been a site built to impersonate Summerborn Boats, a now inactive company. The site has been built professionally with the originally registered number and address listed to try and make it harder to differentiate from a scam. Once they had setup the page and impersonated the company, they stole a considerable amount of marketing material including an array of boat listings from multiple genuine brokers (including ourselves). They advertised the boats for a considerably lower price to pique interest. One of these was a Sealine 255 that we had sold on behalf of a customer previously. To understand their process better, we tested them by posting an enquiry to the website for the “boat for sale”. The offer provided back to us by Summerborn did seem attractive, with a minimal delivery cost and 12 month warranty on the boat. they request a 60% “fully refundable” deposit to be paid, at which point they promise to deliver the boat within 2-3 days, providing a 48 hour inspection period during which you can return the boat to them. Coupled with this, that they didn’t personalise their emails with names, or provide a phone number, which made it clearer that it was likely to be a scam. The website noticed above was live for a month before brokers such as ourselves became aware of it. Having reported it to Action Fraud and Google, it has now been made inactive. But the risk that copy-cat sites will appear is large. If I see something like this, what can I do? One of the best ways to report fraud in progress is to notify Action Fraud (https://www.actionfraud.police.uk/) and your local trading office (https://www.gov.uk/find-local-trading-standards-office). If you’re a member of a boating forum, it might be a good idea to give the community a warning too, which is what happened in the case above. What steps can I take to help buy a boat safely? View the boat you are interested in before paying any money whenever possible. No seller will stop you from viewing a boat. If you are told you can’t view the boat, walk away. Speak to the seller. Many scam websites are based overseas and will not provide a phone number. They like to operate via email only. In the Summerborn case, they do not sign off they emails with individual names. Buy through an established or recommended broker. Brokers who belong to established bodies like British Marine’s “Boat Retailers & Brokers Association” have standards of conduct and regulations that must be upheld by members which offer additional protection to you. Ask to have a survey. As well as highlighting potential problems, this will usually make fraudulent sellers nervous so they will often cease contact with you. Make sure that correct title documents are available. Even if you have seen the boat, having the correct title documents and knowing the person is the legal owner is very important. If you have a professional broker that you trust they will be able to help you with this for a fixed fee. Perform checks when being asked for a deposit. If you want to hold a boat and you are asked for a deposit, check that this is refundable, if any conditions apply and that you are definitely dealing with the right person. Confirm bank details verbally. If you have received bank details for a company via email do double check these verbally as interception fraud can also occur. If in doubt, walk away. You may lose a bargain, but you will also avoid being the victim of a scam.